Reflections on a year of teaching and learning. This past year has been the most challenging time of my life. It’s also been a time of, by far, the highest growth. When I started my apprenticeship program at Penn’s Graduate School of Education (GSE), I’d already developed some nascent ideas on schools and science education. I knew that I loved learning about science; I loved practicing science; and I loved sharing my passion around scientific endeavors. I knew that I hated science classes; I was dissatisfied with the way science was taught when I myself was a student, and I knew wanted do something different. I wanted to fight against facts-driven, knowledge-driven, shallow, transient ways of learning science as I had experienced it. And I wondered—what if students worked through real problems through inquiry, modeling, and experimentation, just as actual scientists would? What if we steered away from a culture of memorizing textbooks and bubbling in scantrons to a culture of asking questions and investigating real issues in the world? So, starting off as a student teacher, I had a broad vision for how I wanted to teach science: actually making it engaging for students, making it relevant to their lives, and developing scientific practices in addition to knowledge. Achieving scientific literacy and deep learning experiences for my students: thinking critically about the nature of science, how to critically evaluate scientific information, and how to apply scientific practices to real-world problems in students' lives. Understanding teaching and learning--not as a one-way delivery of information, but as a dynamic process of theorizing, engineering, and optimizing learning environments. Building networks and supports to continue advancing as a teacher and contributing to teacher development at all levels of scale. Sensemaking: An analysis of student argumentation in post-lab discussion. In my ideal classroom, students are deep in discussion. They’re sharing ideas, investigating problems, and formulating arguments to solve meaningful inquiries. This mirrors the work that real scientists do! In addition to learning about interesting phenomena, they’re also collaborating to evaluate the science behind the phenomena, and the methodology within the science. 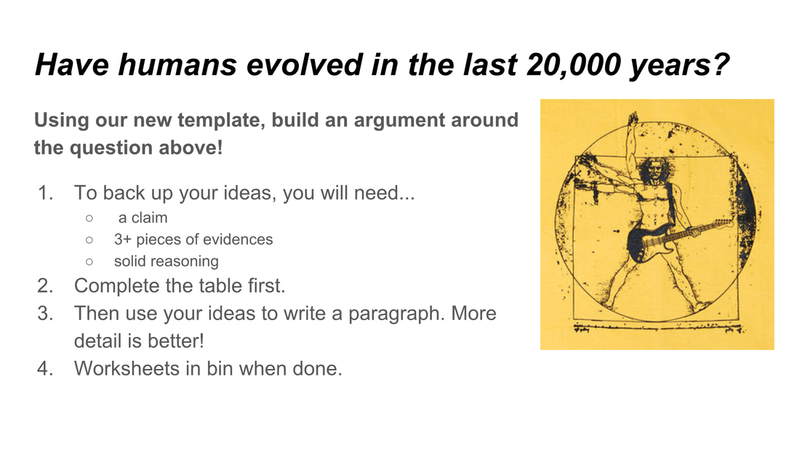 In my goal of fostering creative thinkers and problem-solvers, I want to train students in the skill of argumentation. This means they need to generate, challenge, and justify their ideas. And it works best when students are engaged in authentic discourse. So what should authentic discourse look like? 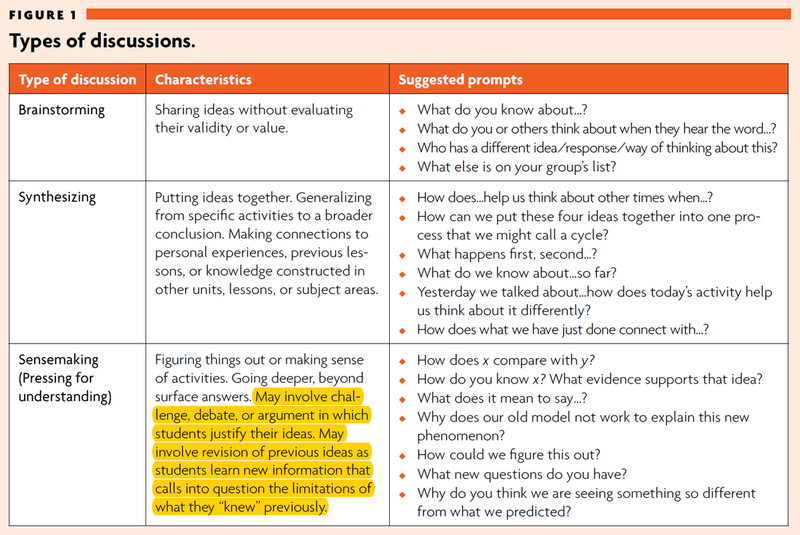 Shwartz et al identify three main types of discussion: brainstorming, in which students share ideas non-judgmentally; synthesizing, in which students connect ideas across activities; and sensemaking, in which students refine their ideas through argumentation and evaluation. I’m particularly interested in sensemaking discussion, as this is the final step where learning is at its deepest. This is when students actually figure things out! Shwartz et al outline this further in the figure below. Note the highlighting as well (emphasis mine). Since argumentation is such a significant part of this pressing for understanding, this may be a perfect opportunity for students to revisit CER. Shwartz, Y., et al (2009). Talking Science: Classroom discussions and their role in inquiry-based learning environments. The Science Teacher, v76 n5 p44-47 Jul 2009. I recently saw an opportunity for sensemaking discussion in the classroom. In a lab investigation on passive transport, students were tasked to explore relationships between surface area, volume, and diffusion rates in agar cubes. 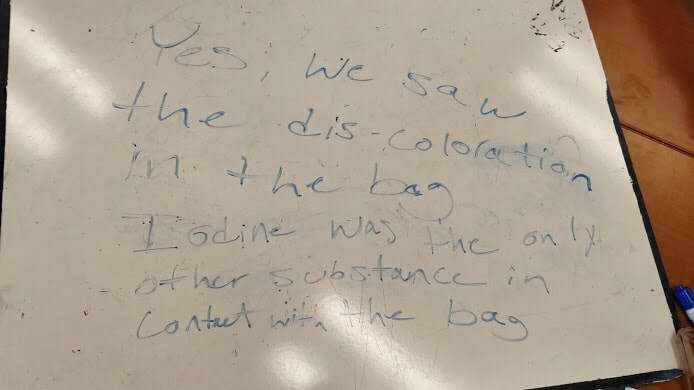 In another section of the lab, they were also instructed to investigate osmosis occurring across a semipermeable dialysis bag. This experience was not particularly student-centered, as students were following pre-dictated instructions rather than coming up with their own inquiries. As a result, though they were somewhat engaged throughout the activity, I didn’t feel that they were completely present in driving their learning forward. 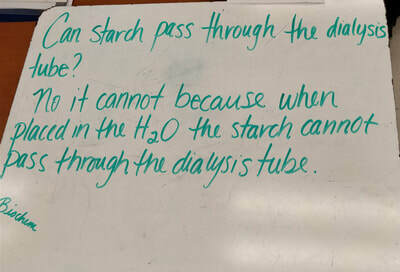 Formative assessment drop-ins confirmed this: they were following the recipe, but they didn’t understand the cooking. So, the next day I implemented some argumentation exercises. We reviewed our experimental set-ups, objectives, and scientific concepts. Why did we use dialysis bags? To represent semipermeable membranes? OK, check. What’s osmosis again? The diffusion of water across a membrane? OK, check. Good: we had a consensus regarding basic learning objectives. But could we successfully explain what was happening in our investigations? I handed each table a whiteboard, and instructed students that we’d be using CER once again. This time, the goal was to make sense of what we saw in the lab. I offered some scaffolding, using water permeability as an example. Were our dialysis bags permeable to water? Claim: Yes, the dialysis bags were permeable to water. Evidence: After placing a dialysis bag into a beaker of water, we observed that the bag increased in mass from 33 to 41 grams. (Note: I wasn’t using actual data here. This was a nod to the big Eagles win!) We also noticed that the bag increased in volume, becoming more turgid. Reasoning: Since water was the only solution surrounding the dialysis bags, it must be water that contributed to the increase in mass. Therefore, water can pass through the material of the bag. ​Responses were variable in nature. Some failed to use CER at all… which was concerning. And others cited scientific concepts or assumptions as evidence, which remains a common gap in logic. But most groups successfully cited evidence from their investigations. And they gave solid reasoning to tie scientific principles back to their claims! Compared to our first time trying out CER, this is a marked improvement. We still have more work to do regarding argumentation. It’s a skill that will need to be incorporated regularly. But, with practice, I’m optimistic that we will continue to improve. And, with time, our discussions will be more and more productive! Building argumentation scaffolds: Analyzing student responses to CER frameworks. 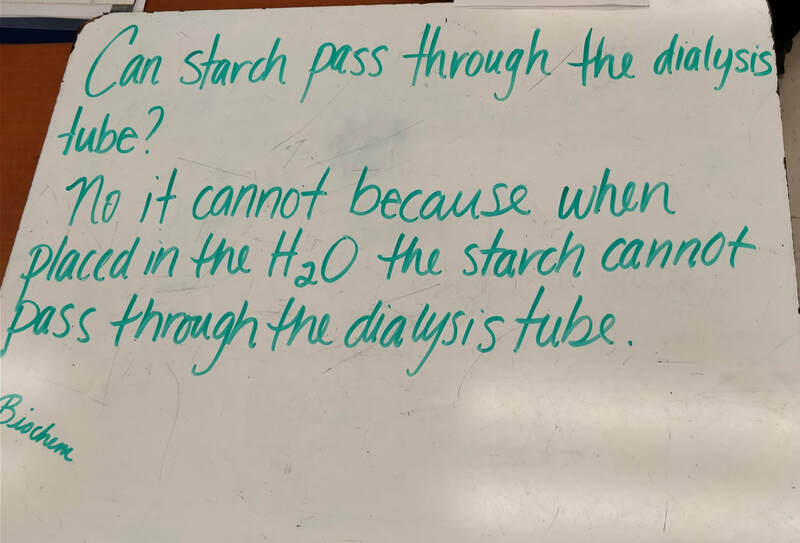 What happens when I teach science students how to form arguments? 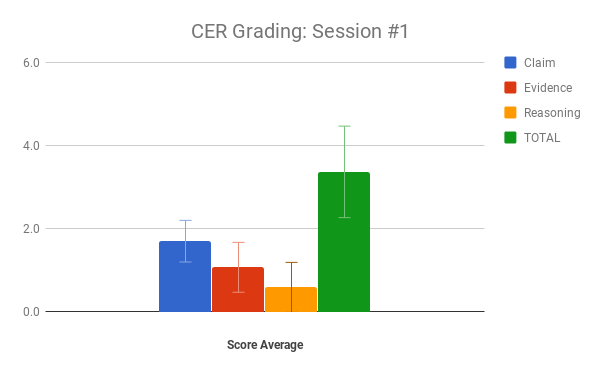 In my previous post, I outlined a lesson where I introduced CER frameworks to my students. The goal here was to offer scaffolds to build stronger scientific explanations. Ideally, by learning how to make their thinking visible, students would then develop their skills in explaining and solving scientific problems. So, how’d it turn out? Here's the prompt we answered at the end of our first argumentation lesson. In general, students had trouble adjusting to this new method of learning and assessment. Most said they were not used to writing at length in a science class. For them, this was more akin to the work of an English or a History class. And they're right: I never did work like this in high school either! But, so much more than memorizing textbooks and bubbling in exams, this mirrors the practices that scientists follow everyday. And if our goal is to learn science by doing science, then developing explanations and arguments is one of the best ways to go. It's a departure from traditional methods, but more and more teachers are beginning to shift focus towards these skills. Nonetheless, this was a new experience for students. So we used a rubric to break down each component of argumentation into a concrete framework. Throughout my thesis investigations, I'll be tracking student progress according to this rubric. First results below! We modeled our CER rubric after this one, modifying the Reasoning category to be out of 2 points instead of 4. Claims were simple and easy. Students varied in the quality of their responses, but typically were strong at coming up with claims. This makes sense; it was a yes/no question. However, some students still provided unstructured or incorrect claims. It will be important to strengthen this skill quickly, because future prompts will be made much more complex. Evidence was more difficult. While many students did a fine job researching and gathering supporting ideas, they were not always relevant. Often, they presented flawed or unrelated evidence. Other times, they simply rehashed scientific ideas to spin them as evidence. Not good enough. Future lessons will need to emphasize that evidence most often comes in the form of data. Reasoning was most difficult. Students received the lowest scores here. (The lower end of the error bar here even went all the way to zero!) Sometimes, similar to above, students would give scientific evidence but offer nothing else. And often they failed entirely to elaborate on why their arguments make sense. As predicted, this is one of the hardest skills for students to develop. How to build on this? Throughout the next several lessons, I want to implement more opportunities for students to practice argumentation. They don't necessarily have to look like the one above; they can range from written passages to verbal explanations, visual modeling, and class-wide discussions. I'll be working each of these in and gathering data simultaneously, and I'm excited to see how students respond and develop with practice! My CM and I recently posed a question to our students: What does an ideal learning environment look like? What are the students doing, and what is the teacher doing? We received a variety of ideas. Strikingly, while many pushed for more amenities and autonomy—music while working, less homework, and more room for creativity in student projects—most wrote about relationships. Our kids consistently demonstrated value towards respect and care in the classroom: they wanted supportive, flexible, and enthusiastic teachers as well as collaborative, attentive, and focused peers. For me, this was unexpected. I did not think so many students would care about our lessons, nor about their peers’ engagement! It’s heartwarming to know that kids share this value, which further lends credence to the role of positive relationships in the classroom. Now, in a climate of no-excuse schools and never smiling until November, this notion may be frowned upon. Why should relationships with students be caring, anyhow? Some may assume that if they give up their role as a disciplinarian over their students, then the kids will no longer respect their teachers. To exhibit caring, as such, would be to extend leniency and opportunities for upheaval. This makes some sense, but more so as a response towards teacher vulnerability. When they are “feeling scared”, Christopher Emdin writes, a teacher’s typical reaction is to “exert power over students” (Emdin 2016, p. 109). This leads to shouting matches, power struggles, and—at worst—humiliation and exclusion towards students who need most to be in school (Noguera 2008). It’s empowering to see that the opposite holds true: relationships are key. In a meta-analysis of over 100 educational studies, Robert Marzano writes that “the quality of teacher-student relationships is the keystone for all other aspects of classroom management” (Marzano 2003). Teachers with high-quality relationships with their students had significantly fewer disciplinary issues and rule violations. Interviews with adolescents, similar to the activity illustrated above, reveal “students’ high regard for teachers who listen well, treat students with respect, and exhibit caring” (Weinstein and Novodvorsky, 2011, p. 50). What do these ways of caring actually look like? Weinstein and Novodvorsky outline a list of ideas: welcoming students by name; learning about students’ lives; addressing students’ concerns, especially avoiding public reprimand and humiliation in front of peers; allowing for student autonomy and input; promoting students’ strengths; and establishing clear classroom expectations (p. 51-65). ​I’m happy to report that as I spend more time with my classroom, it does feel more and more like a community. I’ve learned my kids’ names, and I’m continuing to hear their stories. Our students readily share their ideas on lessons and projects, and I’ve even gotten some voluntary high fives at the door! Focused attention, however, is a concern: I often lead a lesson and struggle to get the whole class engaged. There’s a certain energy and cosmopolitan ethos, as Emdin writes, that I seek to harness in my classroom. As I continue to build on Weinstein’s ideas above, I also hope to introduce practices from Emdin: student mentorships, distributed roles and teaching, code switching and affirmation of student strengths, and co-created norms. I’ll be following up on these practices next post, and talking in-depth on classroom expectations. See you after the jump! What makes a great classroom? Engaging activities, and positive relationships, certainly—but in building an effective and authentic learning environment, it’s also important to consider the physicality of the environment itself. Objects and arrangements can’t be ignored. Beyond their obvious functions, they also reveal teacher philosophies and attitudes towards what is important in teaching and learning. A couch or a rug can demonstrate warmth: an intention by the teacher to bring comfort to an otherwise cold, hard linoleum floor. A circle of desks can promote values of collaboration and teamwork, whereas rows confer hierarchy. These messages, however implicit, directly affect students. A design can tell students that they belong, and that their voices matter—or that they must fall in line, without room for negotiation. 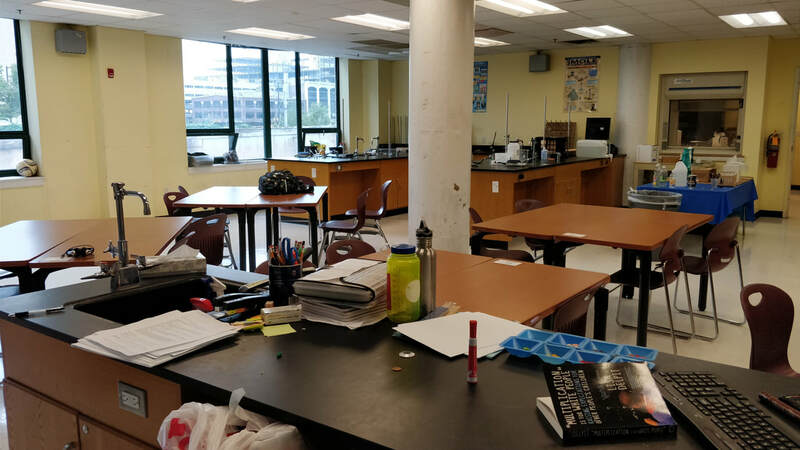 Thus, in this first inquiry, I investigate the physical design of my classroom not just as an aspect of learning, but as an essential foundation for learning. First, seating. The specific arrangement of students reflects the nature of activity to be done. Whole-group discussion and socratic seminars, for example, get a circular formation. Station and small-group activities go into clusters and pods. Presentations and demonstrations require more forward-facing formations. Is one arrangement superior to all others? Probably not, though I’m inclined to say that unbroken rows would be a major hindrance in most classrooms. Throughout my observations, I hope to develop a practical and functional seat arrangement for both student-centered learning, and for direct instruction as needed. Here’s where I fulfill my student teaching. Note the desk arrangements. Here, students sit at large tables, typically in groups of four. Desks are also angled so as to balance direct instruction and group discussion: students aren’t made to directly face the teacher, nor do they ever have their backs to the board. This flexibility allows me to easily assign an activity, and then for students to dive into collaboration. All without moving any desks! In consideration of time management and short passing periods, flexible seat arrangements are a huge plus. Furthermore, given our emphasis on inquiry-based learning, this arrangement seems especially appropriate. Another aspect, which I’ve seen in many other classrooms at SLA: softness. I was surprised to walk into a neighboring classroom one day to see students engaged in a lesson atop a couch! There were also colorful rugs, pillows, and plants. These in no way distracted the students from learning, and may have even aided them. Weinstein and Novodvorsky call this a provision of psychological security, through which kids can feel that “this is a good, comfortable place to be” (Weinstein 28). Once this security is established, and students feel a sense of belonging, then they are motivated to participate and to reach meaningful learning goals. In a science class, this can be more difficult to achieve. The room is typically filled with hard lab benches, dangerous chemicals, and fragile glassware. Here, the incorporation of softness may be even more important—especially when science education is known to be so intimidating for adolescents! This isn’t to say that students should be doing experiments atop flammable sofas and bean bags. Rather, I envision an ancillary “research corner” or “bio zone,” where kids can comfortably choose to sit amongst books, artwork, drawing space, plants, or even a class pet. I introduce items that I myself find interesting—things I can share with my students, to establish a deeper connection—and I also allow my students to cooperate in building this space, to make it a foundational part of our class ecosystem. In my mentor’s classroom at SLA, there are a several of the above items, but not necessarily a dedicated comfort space or research area. Moving forward, I hope to investigate how I may build such spaces. I met Na’vonne and Ahmir three weeks in—about halfway through their STEM preparation program. Since they were the only two students taking biology, they weren’t set up with a classroom instructor. Instead, they were given worksheets and chromebooks, and placed at the back of a chemistry class. Not OK, but there was no other option at the time. So—although I’m officially only involved with this program as an observer—I jumped on the chance to give these kids some extra help. Na’vonne writes with big, loopy lettering--carefully crafting her personality into her words as they fill the blanks on her worksheets. She often runs out of space, and she also misuses terminology. Biology is a new subject to her: she’s never heard of nuclei, ATP, or photosynthesis. But she pays attention and values our lessons together. Ahmir is a seasoned learner in biology, having taken the course in school twice now. He’s failed both times. His understanding of concepts is relatively strong, but his attendance has been spotty. When he does attend class, he’s usually late. Hence the re-takes. This summer, he’s here for one last attempt at earning credit on his transcript. The worksheets my students were assigned attempt to cover foundational units in biology, jumping from cells to DNA, energy, and evolution one unit per lesson. In most classrooms, students spend weeks on these concepts. But here, we’ve only got 45 minutes. And that’s only when my class even shows up on time—or at all. The worksheets themselves are unscaffolded, uninspiring, and one-dimensional in their content coverage. On our first day together, for example, Ahmir and Na’vonne came to me with worksheets on mitosis and meiosis. They were never given explanation on the concepts, except for Ahmir, who’d learned it last year. He made it halfway through the page, but Na’vonne had no idea how to even start. To figure things out, there were instructed to simply solve quiz questions on KhanAcademy. No introductions, no explanations, not even any lectures. This was unacceptable to me, but for them it was a typical day. I’m still deeply frustrated at the way this class was run. This is supposed to be a rigorous program, designed to excite and prepare students for upcoming STEM courses. Instead, this aspect of the program only seems to further disenfranchise them from math and science. There are many reasons for this, but I think one prominent one is in the lack of curriculum and instruction offered. In these four lessons, my students were supposed to have covered the entire spectrum of biology—which I actually think could have been done, if we had talked about true foundations! Instead, we were tasked with answering scattered, insular pieces of the curriculum. This Is a common problem I see in science classrooms: focusing on prescribed content rather than on essential understandings. One curriculum method I’m investigating directly addresses this problem, and flips it on hits head. Fittingly, it’s called backwards design! But I think it’s actually a much more effective approach to teaching. In backwards design, curriculum is foremost structured by considering essential understandings: what we want students to take with them 20, 40 years from now. Regarding cells, for example, I don’t need my students to know every single step and molecule in mitosis and meiosis. I want them to understand the importance of cells, and how they unite all species of life as building blocks. I want them to imagine how a slew of inanimate chemicals can come together to make something alive, and how these formations can be intricately and beautifully structured. From there, then I can design my lesson plans. In my brief time trying this method with my students, they seemed to appreciate it. It also allowed them to finish their worksheets thoroughly and in depth—though I’d prefer different measures of assessment. I still bristle that they had to spread their curriculum so thinly, but there’s no getting around that now. As quickly as I’d started working with Na’vonne and Ahmir, they’ve finished their program and are now off on their own until school starts. In the fall, they’ll be able to come back for academic support—but I worry. This in principle is a fantastic program, but in my limited experience I’ve been made crucially aware of its shortcomings. ​What should be done to address these issues, institutionally and systemically? I get the feeling that whatever changes are necessary will be vastly difficult to implement. For me, science isn't just a way of knowing how things work. It's an ever-changing tool for understanding, navigating, and appreciating the entire world around us! And the worlds within us, as well. 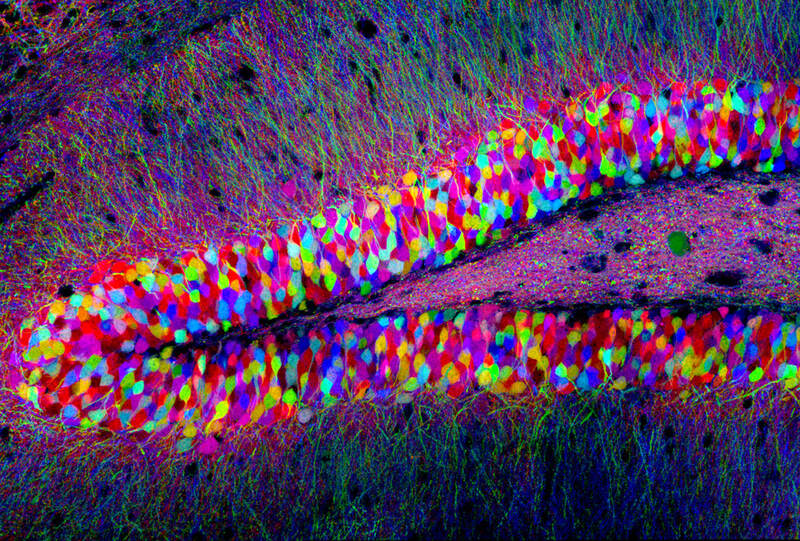 Pictured above is a closeup of the brain's hippocampus. We can see each of the microscopic neurons within it, and all of their branching connections too. Together, these cells form a region that is critical for learning and memory--and it's just one of the many, many endlessly complex components of the brain! Somehow--and we still don't know how--these regions and circuits assemble to form the grand condition that is human consciousness. We're still figuring it out. And in that way, we're kind of like brains learning about themselves, aren't we? This is just one scientific puzzle. There are infinitely more to solve. Some are thrilling, some boring, and others immensely difficult--but together, in practicing science, they bring us closer to understanding life and existence. In practicing science, we find meaning. This is why I teach science: in this pursuit, we as learners and individuals are each made better. We are driven to think deeply and earnestly, and to seek both truth and meaning. We are challenged to be critical, and to collaborate -- and perhaps, even, to bring positive change to this little planet that we all call home. To pass on these skills would be my greatest honor.